 The aircraft is not resistant to crash. Attention should be paid to every flight because one crash may cause a product damaged.  The mobile phone screen is displays with real-time imaging scenarios.  The phone displayed in the picture is just for effect, not included in the package.  Carefully read the instruction before any use, if you are a beginner, it's advisable to be assisted by an experienced adult.  This quadcopter is equipped with coreless motors, continuous work with different batteries is not suggested. Wifi transmission system provides easy and fun FPV flight. 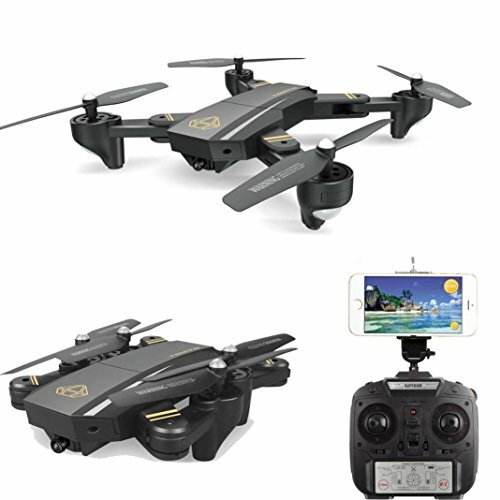  2.0MP 120° FOV wide angle HD camera can take photos and record 720P videos  Selfie RC Quadcopter Drone- 2.0MP HD camera can take photos and record 720P videos.  Foldable design, portable and easy to carry  Unique fuselage design and high quality painting, outstanding appearance. Upgraded 2.4G 4CH transmitter for your easy control.  The latest 6-axis flight control system, provides super stable flight.  With headless mode, and one-key return care free to fly.  High/low speed mode and 3D flip function provide you cool flying experience.  Equipped with barometer and height hold function, easy to fly.